How do permalinks matter in search engine optimization? The page url is the second most important part in on page search engine optimization while first important part is page title. Page url is an address to your webpage or blog and that’s the reason why page url matters. If your address is wrong or improperly written, your friend may go to wrong door or simply may go back to his/her own home once someone told him/her that the address is wrong one. Same happens in search engine optimization, Google or other search engines really love your page url when it comes to indexing your web page. Google’s engineer Matt Cutts explains that Google search engine takes a lot of care about page url during indexing. How? Wait, I’ll explain. Indexing is the process by which search engines save our page content in their databases. Here comes certain different techniques in indexing, while simply think as page titles become keys while page content becomes actual content stored in databases. Now the question arises, if page title becomes key then why to bother about page url? If you note, these keywords are highlighted in red and can be seen again in bold within the search description. Search engines give lot of value to your page url, its clear now. Let’s move on and see how to choose page url to get more out of it. Go to Settings > Permalinks and the rest is shown in the image above. If your target keywords are present in your page title and page url, then you have done almost 70% of your search engine optimization campaign. But still point to remember here is that, don’t spam. Simply mean, never try to overdo SEO; like putting your keywords again and again in page title, page url and in page content as well. Try to limit your target keywords maximum 4% in your whole post and never increase that number, as search engines consider spam over that number (4%). 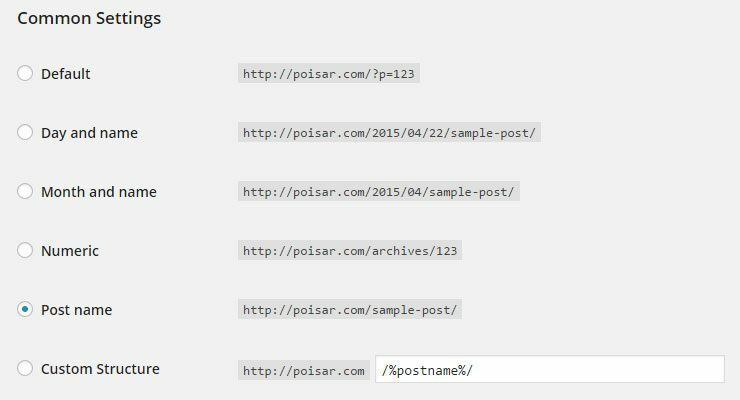 Case sensitive means, poisar versus Poisar, they mean two different word to search engines so never do that in your page titles. Though you’ll be directed to same page in most of the cases but search engines consider it two different things altogether. So, follow a proper way that may be uppercase or lowercase. I do suggest going towards keeping page titles to lower case characters though. It’s not a rocket science to choose Google friendly page url, simply try to use natural language, never keyword stuff, shorter in length, easy to remember page url are best friends of Google. While choosing url never think about search engines, keep in mind your audience. Here it simply means that your url should explain your content without any in depth look or feel. Try to summarize your whole content in page url so that you can get high click through rate, better search engine results. These are very basic while important points to remember in search engine optimization. Try to use these points in your every page and you’ll be getting more out of it.